THE WEEK got off to a good start with lamb numbers jumping up from three to eight, which was great news. As the contractions commenced this week, Wendy decided to have some relaxing music playing to assist the ewes with the deliveries. I know it may seem crackers, as the ewes give birth to some of the gentler sounds of the 70’s and 80’s in the labour ward in the corner of the field, but it does appear to help. One of the newborn ducklings on his farm. Things got even better when we saw our first swallows back on the farm. We had two families nesting here last year, one in a stable and one in the pig shelter. It is a sight to behold watching the swallows patiently build their nest, then feed and nurture their young until they are old enough to fly. Last summer it was a real pleasure watching the young swallows leap from the nest and take their first flight. It’s so exciting to think that we could witness it again this year, so fingers crossed. After our recent green light from ‘planning’ for our farm shop, we have been progressing things in a number of areas, with Wendy now also being given the okay to serve cream teas outside when the weather is fine. We are keen to have others enjoy the peace and tranquillity that we have in the beautiful surroundings we are lucky enough to live amongst. After a recent fortuitous meeting at the local waste disposal centre, we were invited to a very productive networking event at Bishop Burton College earlier in the week. This was a great opportunity for us to make some really worthwhile contacts to source local products and services, and also to gain information to help us moving forward. It’s amazing what can be gained whilst clearing out your rubbish. We have also been busy doing lots of preparation ahead of our photography exhibition, which commences on Bank Holiday Monday. I never realised I had quite so many photographs to wade through and deciding on which to exhibit has been a challenge to say the least. 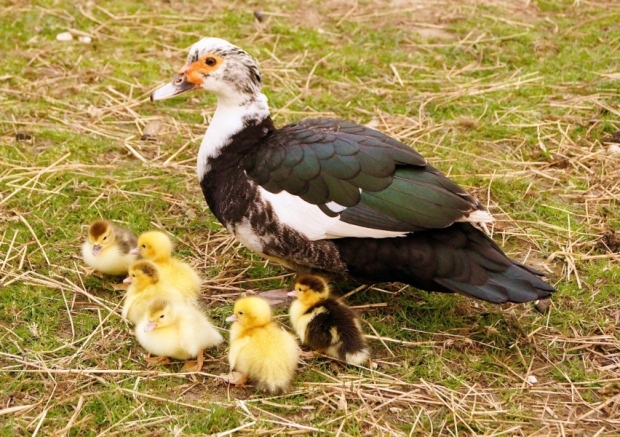 Early on Saturday morning, I had just finished getting all the animals fed and watered and was making my way into the house, when in front of me, waddling out of the barn door came Alice the duck and six little yellow bundles of fluff behind her. How cute was that? I immediately grabbed my phone, hit the deck and lay on my belly to video this new little family for our ‘Ginger Cow’ Facebook page. Now a few days on, she has them all organised and takes them for regular strolls around the farm, I’m sure it’s to introduce them to all their new neighbours. I have to mention something which occurred on Sunday evening too. I was walking past where the pigs live and was alerted by some commotion across the field. I stopped to look and thought to myself, “Would you look at that”. Under one of the chestnut trees, there was a pig, up on the shoulders of her larger sister trying to reach the new chestnut leaves. If that wasn’t enough, they still couldn’t reach the leaves above them and so the pig underneath was jumping up with her sister on her back and only then could she reach the tasty treats above. The amazing thing was, not only did they do this the once but all four pigs took a turn to have some of this Sunday evening supper.